David creeps silently into where Saul is sleeping. AUL SENT MESSENGERS hither and thither to take David, but they failed to find him. Jonathan meanwhile kept trying to save his friend; but when at last Saul threw his spear at him, in his anger at his continuing to plead for David, he perceived that all his efforts were useless. So he and David took leave of each other lovingly; the latter retiring to the wilderness, where he soon gathered together a band of followers. While Saul continued his fierce pursuit of David, his life was twice in David's power, who refused to hurt Saul, though his followers urged him to kill the king. On one of these occasions, David, to proved how easily he might had killed Saul if he would, cut off a piece of his robe when he was asleep. And then, when the king awoke, showing it to him, he besought him not to believe those who had told him that David desired to take his life. Saul's hard heart was softened by his appeal, and he said to David, "Thou are more righteous than I;" for David had returned him good for evil. Saul added that he knew David should be king after him; and he entreated that his sons might not be put to death when David came to the throne. David solemnly promised this, and then Saul returned from pursuing him. But David, not daring to trust himself with him, went back to his stronghold in En-gedi. Saul's reconciliation with David did not last long. He was soon hunting him again with a force of three thousand men. He had pitched his camp in the wilderness; and David, with Abishai, one of his followers, came down to it at night. The people were all asleep, and Saul's tent was set up in the midst of the encampment. The two stole in among them, and came silently to the place where Saul lay sleeping, with his spear stuck into the ground by his pillow, surrounded by his guard, with Abner their captain, all fast asleep. 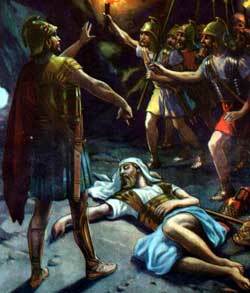 Abishai wished to kill Saul, But David would not suffer him. Only to show Saul once more how completely he had been in his power, he carried the spear, and water-bottle, that stood by it, away with him to his own camp. When he got there he called out tauntingly to Abner, and the king's guard, asking whether they were not pretty defenders of their master, and bidding them send some one to fetch back the king's spear. Saul knew the voice; and when David complained to him of his merciless pursuit of one who had so often spared his life, he relented, and said he would do David no more harm.